When I installed my 2000 Cabby gauge cluster I was happy to discover that it had the rear fog indicator icon in the bottom row where all of the other idiot lights are. My 1995 gauge cluster did not have this icon. Now that I had a Euro light switch and functional rear fog I decided to make use of the rear fog icon in my cluster. 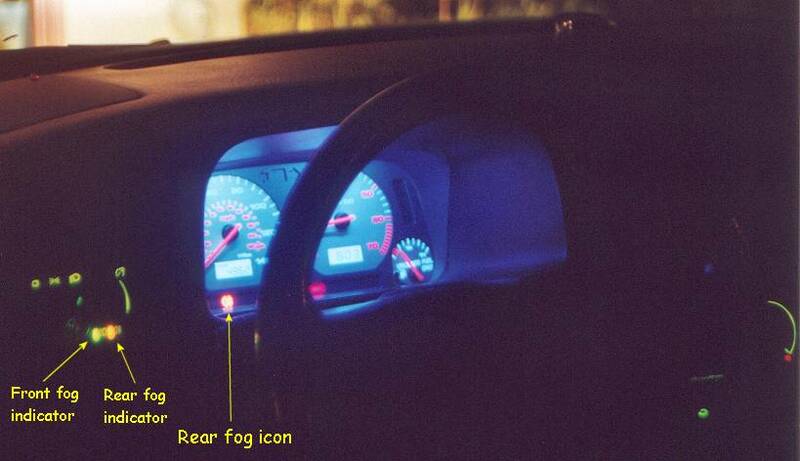 The procedure is extremely simple if your gauge cluster has the icon and you are running a rear fog light -- heck, you could even make it work with front fogs if you wanted because you are simply tapping the wire that supplies power to the fogs and tapping it into a wire that powers the icon. Using a wire tap, tap into the wire that supplies power to the rear fog. In this case, using the Euro light switch, you would tap into the wire that comes out of #12 in the light switch electrical plug. This is a feeder wire. Remove your gauge cluster and look at the white electrical plug that connects to the back of the gauge cluster (the red plug connects directly below the white one). You will see mostly thin white wires. There will be one thin red wire. This is the wire you want to tap the feeder wire into. That's it! Re-install the gauge cluster and you're done. When the rear fog gets turned on, power will go to the rear fog as well as the feeder wire, which will supply power to the rear fog icon in the gauge cluster -- yeay!